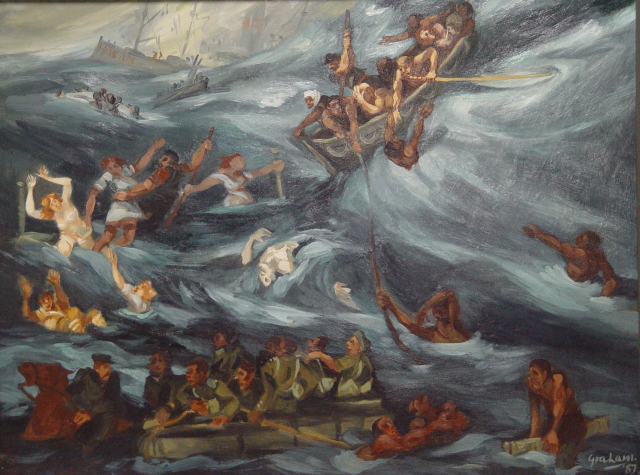 On the 100th year anniversary of the tragic sinking of the SS Mendi, the Nelson Mandela Metropolitan Art Museum will open an exhibition of over 200 sketches culminating in a vast final triptych by local Eastern Cape artist Hillary Graham. This remarkable artwork reimagines this tragedy event in vast series of tableaus depicting victims of this nautical disaster. This vast collection of artworks is part of the Art Museum’s permanent collection and will be on show to the public from 21 February 2017 until 18 May 2017. The exhibition will be opened by the artist Hillary Graham. Lelethu Mahambehlala (Poetic Soul) will perform the famous poem Ukutshona kukaMendi (The Sinking of the Mendi) by S.E.K. Mqhayi and poet Brian Walter will perform a selection of poems from the collection titled Mendi: Poems on the Sinking of the Mendi by Cathal Lagan, Basil Somhlahlo and Brian Walter published in 1994.